Star Trek Fans at Star Trek: Mission New York. Photo Credit George Carmona 3rd. 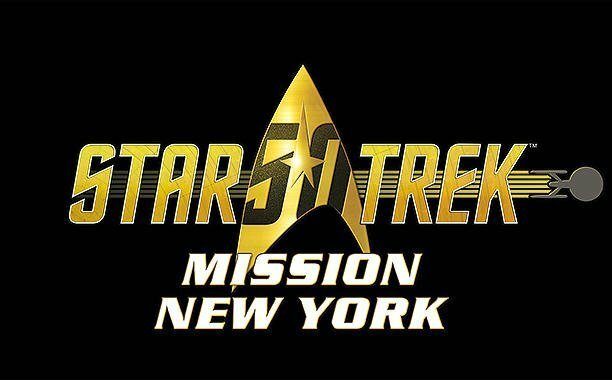 Unless you’ve been trapped in the Delta Quadrant on the weekend of September 2-4, then you know that fans from all over beamed into New York’s Javits Center for Star Trek Mission. The event was a convention for Trek geeks to come out and celebrate 50 years of all things Star Trek. 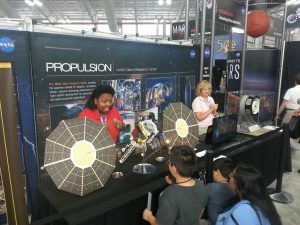 Produced by ReedPop, the same crew that puts on the various Comic Cons, this weekend was a celebration of the shows, movies, books, games and the fans that have carried on the vision of Gene Roddenberry’s wagon train to the stars. Not as big as its Comic Con cousins, Mission was a quality affair for the Trek lovers of the world, and fans that came were given plenty of space and treats to enjoy themselves. 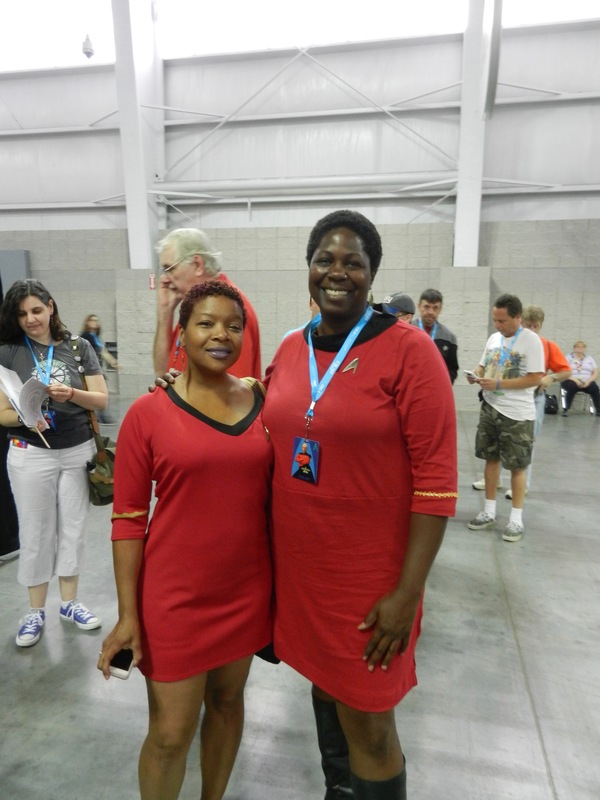 Two of the “Uhura’s” I ran into at the con, weren’t just Trekkers, they’re ministers here in the city. Since being a little girl, Kym watched Star Trek in syndication on channel 11 here in New York, while Bridget came to Trek later on as a teen with the Next Generation. For the two ladies, it was the message of togetherness that spoke to them, in addition to wanting to build that vision of inclusiveness in the real world. Star Trek fans learning about some fascinating science. Photo Credit George Carmona 3rd. Star Trek Deep Space nine cast members Rene Auberjonios, Terry Farrell, and Michael Dorn. Photo Credit George Carmona 3rd. Members of The Black Tribbles podcast, Fan Bros podcast, and BlackSci-Fi.com correspondent George Carmona 3rd (pictured in the white shirt). 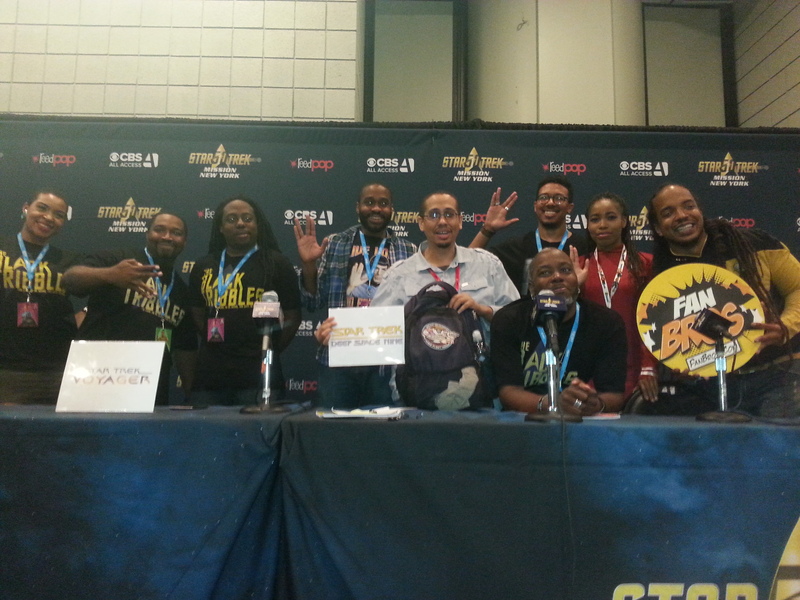 The Black Tribbles out of Philly, put on two great panels, one called Star Trek into Blackness, where they talked about the most prominent people of color in the Trek universe in their very Tribble way. They followed that up with a panel talk with David Gerrold, the original series writer of the episode the Trouble with Tribbles. We learned the origins of the name Tribbles, his role in the DS9 episode that travels back to that episode, and his induction into the Tribble Nation. These cats like to get their geek on. 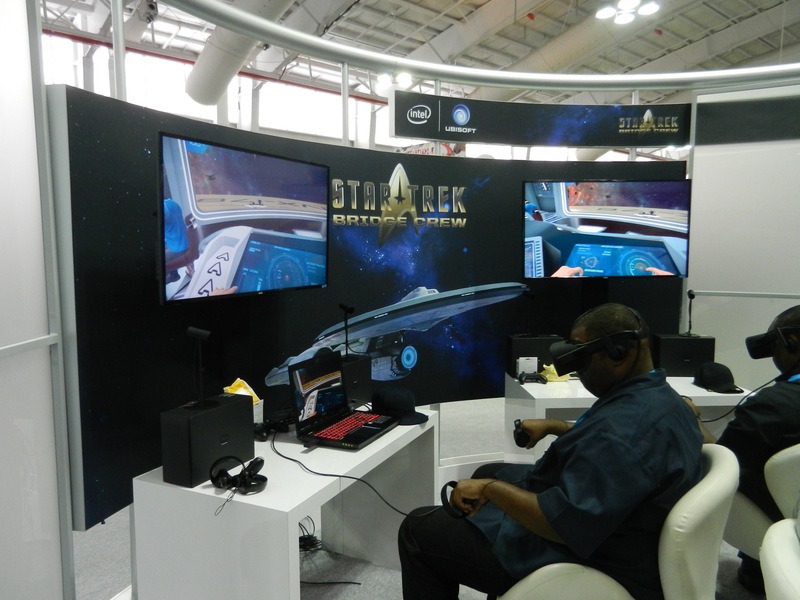 Star Trek fans enjoying UbiSoft’s upcoming Star Trek: Bridge Crew. Photo Credit George Carmona 3rd. But the ultimate treats for con goers had to be the Captain’s Chair from the Enterprise, courtesy of Star Trek Original Series Set Tour. This set was rebuilt from detailed blueprints to be a near perfect replica for the production of online fan films, and now the entire set is located in upstate New York. Fans were able to sit in the chair and get their picture taken. 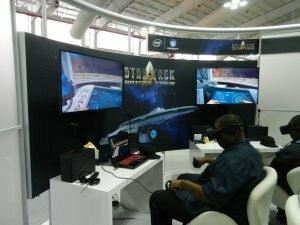 And if just sitting in the chair wasn’t good enough, the kind folks from Ubisoft let us play their VR game Star Trek: Bridge Crew. I’ve done other VR games and this one is a few degrees away from a Holo Deck. The immersiveness, gameplay and just general all around badassery made this game one of my top five highlights of the whole weekend. Later that evening the folks at Star Trek Timelines gave one hell of an after party, with special guest John de Lancie. To sum it up, the weekend truly was a fantastic, fun filled celebration that Star Trek creator Gene Roddenberry would have been proud of. Mission accomplished, Happy 50th Anniversary Star Trek. George Carmona 3rd is an Artist / Designer, former Milestone Media Intern, former DC Comics paper pusher, book lover, lifelong comic geek, has been in 4 Star Trek novels and rocked the tactical station on the Bridge Crew Simulator. You can find his work at FistFullofArt.com or follow him on twitter at GCarmona3.